While we, here in the United States, have been occupied with serious issues such as the Fiscal Cliff and the seeming breakdown of our national security infrastructure, the people of Egypt have once again taken to the streets. It has been nearly a year since millions of protesters from a variety of socio-economic and religious backgrounds demanded the overthrow of the regime of Egyptian President Hosni Mubarak. The protestor's grievances included police brutality, lack of free elections and freedom of speech, and corruption. 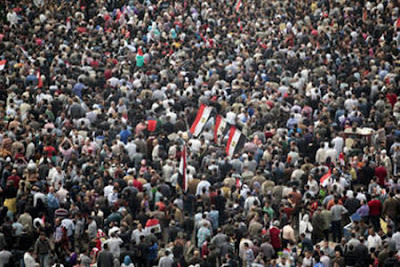 In a little over two weeks, which saw 846 protestors killed and over 6,000 injured, Mubarak resigned. Months of turmoil and violence ensued, with protestors swarming Tahrir Square in opposition to the military junta, which had taken over after Mubarak's resignation. They demanded immediate governmental reforms and a transfer, via free elections, to a civilian government. On June 24th, 2012 they got what they asked for. After a heated and controversial election, Islamist Mohammed Morsi, backed by the Muslim Brotherhood, was declared the 5th President of Egypt. Now, it seems, the Egyptian people are once again unhappy with their ruler, and with good cause. Yesterday, over 200,000 people filled Tahrir Square to proclaim their opposition to the latest decrees by their President. Last week, Morsi granted himself sweeping new powers that, in effect, give him dictatorship-like authority. His declaration made all his decisions immune to judicial review and banned the courts from dissolving the upper house of parliament and an assembly writing the new constitution, both of which are dominated by Islamists. This constitutional drafting process has long been embroiled in debate over issues including the role of Islamic law, presidential powers and the rights of minorities and women. Almost all secular members of the 100-member constituent assembly have withdrawn, walking out of the committee. The elimination of judicial review has resulted in Judges going on strike and lawyers joining the protestors. In short, the country is in chaos, as it faces both a struggle to revive its economy and to define just what kind of government will rule. Will Egypt become a Democracy or another Islamic State, is yet to be determined. If the Muslim Brotherhood has its way, any balance or separation of powers will be a non sequitur. As for the people, they have made it clear that they are not willing to exchange one regime for another. They fear that the current draft of the constitution, or one that Morsi would enforce, would curtail freedoms such as speech, and women's and children's rights. The protestors are calling for the resignation of Morsi. However, there's an elephant in the room, and he's not likely to go quietly. The Brotherhood's stated goal is to instill the Qur'an and Sunnah as the "sole reference point for ...ordering the life of the Muslim family, individual, community ... and state". They have a foothold in the Presidency of Egypt, and they are not likely to relinquish it. All of this takes on a whole new light when you consider that Mr. Morsi was pivotal in negotiating a cease fire between Israel and Hamas last week. His star seems to be on the rise in the Middle East, regardless of the fact that his people have turned on him. How does all this effect us? Because, I can assure you it does. Did you know that Mr. Morsi made his first official trip outside the Middle East by visiting China? That would seem to signal that China plays a very important role in Morsi's foreign policy agenda, wouldn't it? Especially since the U.S. gives Egypt nearly $2 Billion each year in foreign aid. Couple this news with the fact that China enjoys a much more popular standing among the Egyptian people than the U.S., and the increased economic interconnectedness, and I think we have a problem. You see, Egyptian/Chinese trade jumped 46% from 2008 to 2011, surpassing Egyptian trade with the U.S. If that's not enough to convince you that we need to keep our eye on Egypt, consider this: Egypt is following the course of other Muslim states -- including Pakistan, Indonesia, Saudi Arabia, Iran and Turkey -- which have returned China's embrace of their economies. That does not bode well for our foreign trade or our national security. Maybe I'm wrong, but it seems to me that the U.S. and Washington are experiencing declining influence around the globe and China is only too happy to step in. Because Washington is not regarded very highly among the average Egyptian on the street (or the Arab Street, in general) our enemies are chomping at the bit to cement these foreign alliances and cultivate ties with these emerging powers. Now is not the time to play it safe. Psalm 31:11 "Because of all my enemies, I am the utter contempt of my neighbors and an object of dread to my closest friends— those who see me on the street flee from me."